Strength as a skill is the idea. If you understand specifically how to use the body in the most efficient manner, you will get stronger without really getting stronger. Take a big farm boy and have him lift something big overhead. Note the weight. Now get an Olympic weightlifter half his size and have him do reps with the same weight overhead. It is about the skill. Even in the realm of machine training, the first six weeks are considered skill training where gains in resistance are attributed skill enhancement and not true muscular gains. Finding a specific groove and greasing it will make you more and more efficient. Think of the neurological picture like this. You are faced with a large yard that is waist high in weeds. You have a machete. Your goal is to cut a path through the weeds. If you are sloppy and just swing with no plan, the path will be crooked and hard to walk. If you exhaust yourself by chopping the weeds down to the dirt, you may not be able to cut them for days and they will regrow. The exhausting task ahead of you will be distasteful. You won’t want to keep it up. The correct strategy would be to plan the work efficiently with short sessions that gradually diminished any high weeds and repeat this process frequently. Soon, the path will be established, well worn, and easy to walk. This “cleaning of the path” is what proper skill training for strength does. It creates pathways of least resistance and maximum efficiency. This skill can be in born, or taught. This strategy should prevent injuries. The most effective path should be the strongest one. The one that protects the joints and soft tissue. This is not always the case. Practicing the same moves for years and years can lead to over use patterns. Most modern training practitioners currently to pre-hab and re-hab, and practice preventative strengthening of associated muscle structures. With careful observation of form and specific forensics on any soreness or alterations in mobility, and smart trainee can dodge the bullet of injury. There is another way. We have already discussed that specificity rules when it comes to strength. That is,…practice makes perfect only if you practice perfectly. Well what if you got unspecific for a period of time? What if you became,…UnGrooved? Back off weeks, back off days, and even back off months are not uncommon. These periods are designed to let the body recover and not regress. To regroup but not reduce. Some training cycles practice totally unassociated fitness activities such as the old Speed Skating team practicing biking in the off season ala Eric Heiden. I have a different idea. If you think about it, bodybuilding is just the opposite of weight lifting. Weightlifters want to make a weight feel as light as possible by maximizing their technique. Bodybuilder using various tricks, want to make a weight feel as heavy as possible. Weightlifters want the resistance to fall within a highly specific groove. Bodybuilders want to use resistance through many grooves to ensure maximum stimulation of the targeted muscle groups. Well, why not reverse engineer some bodybuilding tricks to apply to strength crew? This is hardly news since many training systems see tremendous value in practicing muscle specific training. West Side Barbell would be one of them. Here is another idea that is NOT so extreme as having you do concentration curls in baggie sweats with an IPod on and a funny doo-rag on your head. Vary the groove. Get ungrooved. 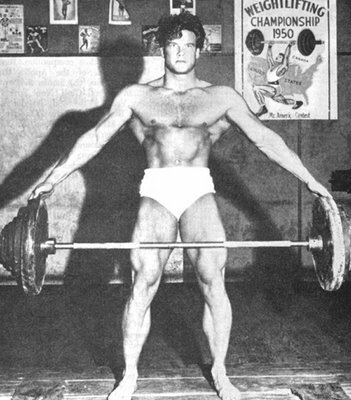 Years ago Arnold Schwarzenegger, at least according to his Weider articles would do lots of bent over rows. He would use the Weider “Muscle Confusion System” though. Each set he would vary his grip, going from narrow, and taking five sets to go to a wide grip. This according to The Weider Research Group, would give his muscles that “fully developed look”. This is hardly new, but an interesting strategy to keep things non specific during weeks, days, or months when recovery and injury prevention are prioritized over pushing to the bloody edge session after session. Dorian Yates would in fact, vary his hand spacing within a set of chins in an almost Rest/Pause style of training. Other individuals vary the angle of their incline bench presses through out the set. All of these are excellent, open ended, outside the box, thinking processes. Now is the time to list your favorite exercises and filet them into parts. Let’s see, Deadlifts??? Use the rack. Start with reps on a block, shorten the range each set with pins, then do the final set as a set of shrugs. Squats?? Start narrow. Real narrow. Tony Pearson, 1978 Mr. America would do all squats and leg presses with his feet so close his thighs would touch. This might be a lot of fun to try! Bench Presses?? Angle of the bench, spacing of the hands, or vary where you touch your chest, ever so slightly. Pulldowns, rows, chins, can be varied by the set, or within the set. Curls and Triceps Extensions should include pronated, neutral, and supinated components. In fact, when power lifter Steve Wilson blew his bicep wide open years ago, his surgeon recommended doing curls in sets of palm down, thumb up, and palm up for rehab. You could hardly argue with his success. He exceeded his pre -injury record. The only limitation is a lack of imagination on the lifters part. Thinking one way all the time certainly limits your options. You begin to get stuck in a groove. Well, it is time to get UNGROOVED.